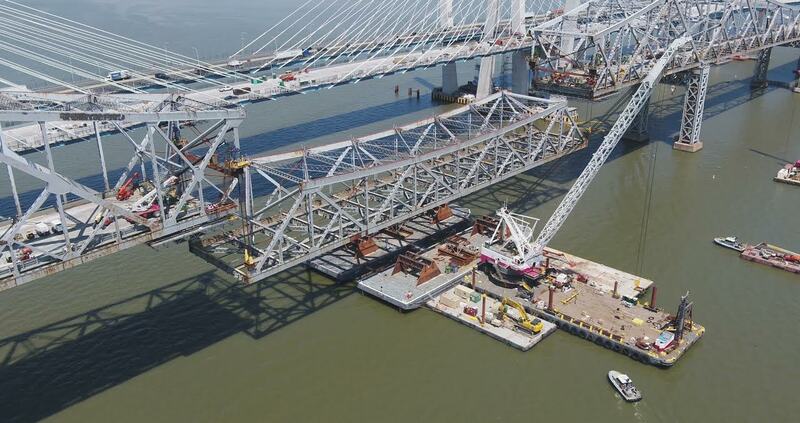 Seven months after the final set of tires crossed Tappan Zee Bridge, crews began removing the first of five sections from the cantilever truss structure’s 2,415-foot main span. The process of dismantling and placing its 532-foot-long center span onto a barge began Monday evening. While boaters were advised the main span channel would be closed for 48 hours to accommodate the operation, the precise time for completion had not been determined at press time. Eight hydraulic strand jacks lowered the 4,750-ton suspended center span onto a barge to be transported offsite for further disassembly. Two moveable barrier machines, no longer needed, and 133 deck panels removed at an earlier time will be sent to nearly 12 state and local municipalities. Last November, Tappan Zee Constructors, LLC (TZC) and the I Lift NY super crane began the year-long process of dismantling the old bridge by removing sections of steel. Westchester County Executive George Latimer called the new bridge “a symbol of innovation and technology. The Tappan Zee Bridge served our County well, but transportation needs have changed since it was constructed, and it is time for it to be taken down. Both counties will benefit from the Lower Hudson Transit Link system that begins November 2018 and replaces Rockland County’s Tappan Zee Express buses. 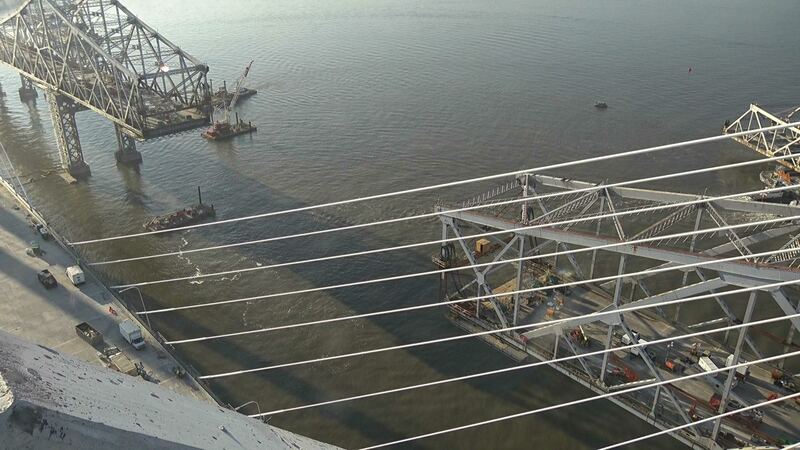 During the coming months, crews will remove two main span sections via barge-based cranes. Strand jacks will assist with lowering the two anchor spans, after which the super crane will help remove the main span’s steel support structures, completing main span removal by late fall 2018. “New York is leading the nation in rebuilding and reimagining our infrastructure so we can meet the demands of the fast-paced, 21st century economy,” Governor Andrew Cuomo said. This milestone in the project’s development follows the opening of the new TZ’s westbound span August 26, 2017. Eastbound traffic shifted to that span six weeks later. The final set of commuter rubber met the Tappan Zee Bridge’s road deck at 10 p.m. October 6, 2017, when Nyack resident Seth Kestenbaum drove his restored 1929 Ford Model A across the span prior to its retirement. Four lanes each of opposite-direction traffic on the westbound span will continue until the eastbound span opens later this year, when each span will each have eight general traffic lane — four breakdown and emergency lanes and dedicated bus lanes — in addition to space for commuter rail when funds become available and a bicycle and walking path. “Infrastructure investments such as this are invaluable components of a vibrant state economy, and none are more important to our region than this new, more resilient and stronger crossing,” Tarrytown Mayor Drew Fixell noted. “The construction of this new bridge will provide safe and more efficient travel for residents and visitors for generations, and I thank the Governor for recognizing the need to take action to replace the Tappan Zee,” South Nyack Mayor Bonnie Christian commented. Design-build construction championed by the governor incentivizes the private sector to be creative on methods that speed up construction time and reduce costs and is used across New York’s large infrastructure projects, including the new Kosciuszko Bridge in New York City. “The new bridge marks another step toward transforming New York’s infrastructure, reducing congestion for motorists and generating immense economic benefits for local communities, “ Thruway Authority Acting Executive Director Matthew J. Driscoll commented. “(It’s) a great example of the state’s commitment to future generations of New Yorkers,” New NY Bridge Project Director Jamey Barbas agreed.